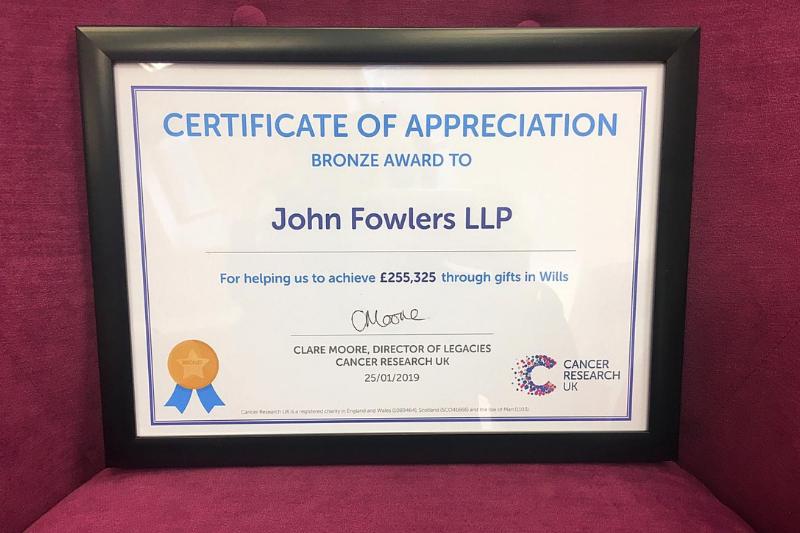 On 25 January 2019, we were delighted to be awarded the Bronze Award from Cancer Research UK for raising £255,325 for the charity through gifts in Wills. On 25 January 2019, we were delighted to be awarded the Bronze Award from Cancer Research UK for raising £255,325 for the charity through gifts in Wills. This money will go towards funding vital research in the fight against cancer. It couldn’t be simpler. As part of the Free Will Service scheme, our solicitors will donate their time for free for anyone aged 55 or over who wants to write or update their Will. Most clients using this scheme will leave Cancer Research UK a gift, despite there being no obligation to do so. Why do we take part? Legacy gifts fund around a third of the research the charity does, which is why we’re happy to partner with Cancer Research UK. Cancer Research UK spent £53 million in East Anglia last year. Some of the studies in Cambridge from this funding resulted in Bioinformatics – using powerful computers to decipher the genetic makeup of tumours in 500 different patients to help understand what makes oesophageal cancer tick. Cambridge scientists also made a landmark discovery that could revolutionise the way we diagnose and treat breast cancer. They reclassified the disease into 10 categories based on the genetic fingerprint of the woman’s tumour. We hope that in future this will enable doctors to match each person to the treatment most likely to be successful in tackling their cancer. Every day, 90 people in East Anglia are diagnosed with cancer. Deaths have fallen by a tenth here in the last 10 years. Thanks to pledges from some of our clients, we’ve been able to help see these results and will continue to support Cancer Research UK. Ready to create your Will? Find out more about the Free Will Service scheme or contact us.